A new, state-of-the-art pacemaker called MicraTM is now being used at Stony Brook University Heart Institute to treat some patients with a heart rhythm disorder called bradycardia. With bradycardia, also called slow heart rate, the heart beats too slow for the heart to pump enough oxygen-rich blood to meet the body’s needs. When this happens, a person may feel weak or out of breath, have no energy or sometimes faint with even minor exertion. To treat this pacing dysfunction of the heart and make a patient feel better, a pacemaker is often recommended. Not everyone with a slow heart rate needs a pacemaker — the presence of symptoms and the type of rhythm disorder are key. Heartbeats are caused by electrical pulsing within the cardiac muscle. If the heart’s internal electrical system isn’t keeping the heart rate at a normal pace, a pacemaker may be implanted. When the heart’s rhythm isn’t right, the pacemaker sends an electric impulse to the heart to help normalize the rhythm and ease a patient’s symptoms. 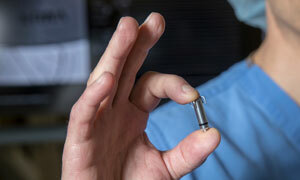 To implant a traditional pacemaker, a “pocket” is made under the skin just below the collarbone. Wires are then guided through a shoulder vein into one, two or three of the heart’s four chambers, depending on a patient’s particular rhythm disorder. Once the wires are positioned in the heart, they’re attached to the pacemaker. The pacemaker is then inserted into the skin “pocket” and the incision is closed. Micra is a revolutionary new pacemaker for patients whose heart rhythm dysfunction can be treated by a pacemaker in the right lower chamber of the heart (the right ventricle). It is not appropriate for patients who need two- or three-chamber pacing. The Micra pacemaker is a significant breakthrough for patients in many ways, including a streamlined implantation method and an improved quality of life. Micra is about one inch long and one-quarter of an inch wide — 93 percent smaller than traditional pacemakers. So it can be implanted entirely into the right ventricle of the heart. Unlike traditional pacemakers, the Micra device cannot be felt when it’s in position. The Micra pacemaker is totally self-contained. There are no wires that can break, wear out or malfunction. Everything Micra needs to regulate the heart rhythm is inside the device. The implantation procedure takes less than an hour. A catheter — basically a hollow tube — is inserted into the right femoral vein through an incision in the groin. The catheter carries the pacemaker up to the right ventricle of the heart. Using fluoroscopic guidance to show real-time moving images of the heart chamber, the Micra pacemaker is attached to the right ventricle muscle in a location where it will provide the best pacing assistance for the patient. The catheter is then removed and the small incision in the groin is stitched closed. Micra lasts as long as a traditional pacemaker, or possibly even longer. Implantation via catheter means there’s no incision in the chest that could leave a scar or get infected, there’s no “bump” on the chest where a traditional pacemaker sits, and there are no wires connecting the pacemaker to the heart. Patients spend the night after the procedure in the hospital. Like all pacemakers, Micra doesn’t cure the disease or stop its progression. But it can ease symptoms enough to make a patient feel much more comfortable and able to go about daily activities and perhaps even start or continue an exercise regimen. Properly implanting Micra is a learned skill requiring a great deal of precision. The device must be placed in the area of the right lower chamber where it will provide the optimal amount of pacing for the individual patient. Precise placement also helps to extend the active life of the Micra, which can be up to 12 years or longer depending on the amount of energy the device expends. In the Stony Brook Heart Rhythm Center of the Stony Brook Heart Institute, Micra implantations are performed by cardiologists Eric J. Rashba, MD, Director of Electrophysiology; Roger Fan, MD; and Ibrahim O. Almasry, MD.